The first is a short walk from the stream to the cold water. Later they moved up and down about three mountains. The highest mountain about 500 meters. After you will walk down to the origins of Than Mayom Waterfall and sleep overthere. You can swim while we are setting up camp and cooking foods. Nighttime, You can shine a light to see wildlife, If lucky you may see Slow loris and Civet. In the morning you will wake up and see the sunshine. Around you is filled with the sound of birds,and had breakfast and coffee.When storage is complete. We will travel through the beautiful jungle for about 4-5 hours. 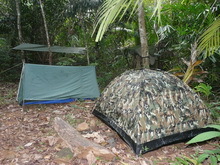 Price Includes : Transpotation, Tent/hammock, Mosquito Repellent, Drinking Water and 3 Meals. Pick you up from your hotel between 9:00 - 10:00 am. Climbing up to the top from White Sand Beach. A 5-6 hr walk through the rainforest. 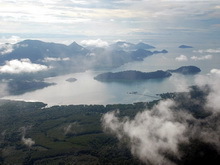 All the way to the outstanding peak with 360 degree view of Koh Chang and other island of the national park. 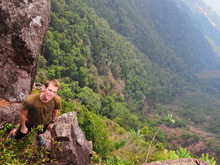 On the way up you will see great views,wild plants, insects and birds on the trailside. This program is specially for those who find themselves fascinated with adventure and the discover of nature. Price Includes : Transpotation, Backpack, Mosquito Repellent, Drinking Water and Meal. Pick you up from your hotel between 8:30 - 9:00 am. Walking up from Salakphet village. A 5-6 hr walk through the rainforest. 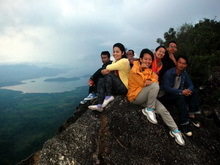 On the mountain is the most great view of Koh Chang. 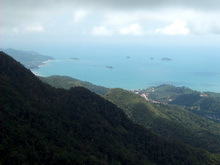 Overthere you will see all of Salakphet gulf and other side Bang Bao village. You can sleep there if you want to see the most buetiful sunrise at Koh Chang. Don't forget your camera !! !